This ridiculously easy DIY is a trade secret for acne fighting. Thyme, that little kitchen herb we use to add a lovely bit of flavour to roast veggies and the like, has also been found to be stronger and more effective (when applied topically) at fighting the bacteria that causes acne than the commonly used benzoyl peroxide (which is extremely harsh and can often have side effects such as skin irritation and burning). I had been wanting to try making my own thyme treatment toner for helping with my problem skin for ages now and finally picked up a big bag of the herb from holland and barrett for £1.99 a few weeks ago. The DIY is easy as pie and all you need is two clean and sterile glass bottles (one to infuse and the other to strain the liquid in to), witch hazel and dried thyme. 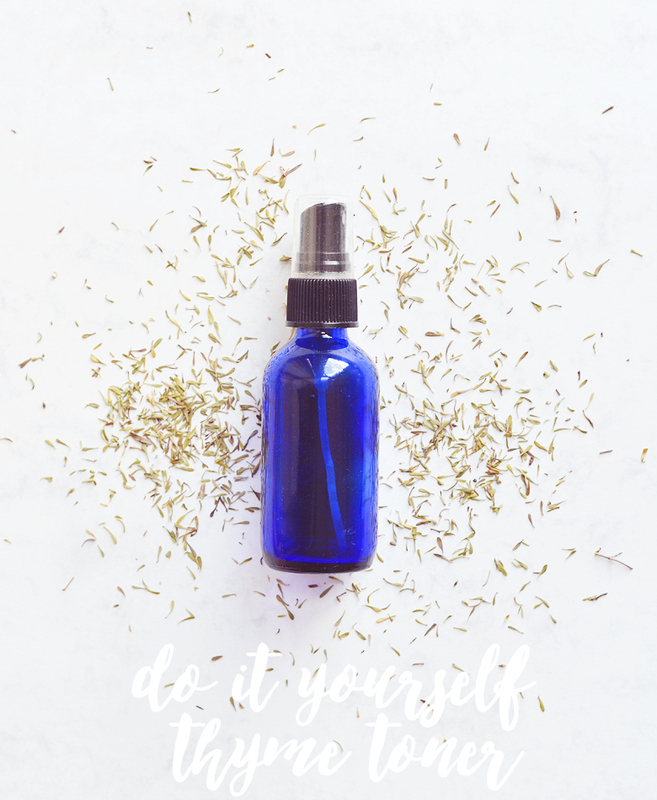 You can also get fancy with a few drops of essential oils, use apple cider vinegar or even infuse your thyme into an oil to create a facial oil instead. I went for the simple witch hazel and thyme route and used 1 tablespoon of thyme with 40ml of witch hazel. I then left this to infuse for 48 hours, shaking the bottle every now and again, in which time the liquid turned a dark brown (this is good). I then poured the infused liquid through a sieve into a second clean bottle, I used an old toner bottle that had a spray pump as this is how I like to use toner, but you can obviously use any bottle you like. The finished result is a funky smelling toner that has strong antibacterial benefits, works quickly and effectively to calm redness and battle breakouts, whilst the witch hazel is a great astringent for oily skin. I've used up my first batch now and have a second brewing up (feeling like a potion master) as I really enjoyed using it and feel like it has helped my skin. I don't think I've ever used a product with benzoyl peroxide so I can't compare the two unfortunately, but if you're looking for something natural, gentle and with simple ingredients I would look into this too, for under a tenner you can have a powerful remedy for blemishes at your fingertips.